Do you meet the minimum requirements to be able to work on a yacht? To be eligible to work on a yacht you must..
Before you can even consider pursuing a career in the yachting industry, there are 4 minimum requirements that you have to be able to meet, and if you aren’t willing or able to do so well, don’t quit your day job! I don’t want to sound harsh, but I would hate to waste any more of your valuable time by continuing to read this guide. After reading through this section you will be able to create a checklist of what you will need to obtain before you can begin looking for work. This is basically just a quick doctor checkup/physical. It’s around $100 USD and is also required by most boats. valid for a maximum of 2 years. Live on a boat full time, in tight quarters with other crew members. Work long physically demanding shifts- sometimes 16 hours or more, for weeks on end. Work outside in the elements, or inside in small spaces, if your position requires it. You should be willing to commit to working for at least 6 months, but ideally, a year when you are starting out in the industry. In many cases it is unlikely that you will be given permission to go home during the first year or so- this includes holidays, weddings, etc. You will be away from friends and family for long periods of time, this means if you have a pet, significant other, or child, you need to kiss them goodbye because you will not see them for a while! You must mentally prepare yourself for life on a boat – you will give up privacy, space, and freedom… It’s worth the sacrifices because you will gain much more! STCW-95 which stands for Standards of Training, Certification, and Watchkeeping. It’s a cool class and very necessary, lots of survival techniques and first aid in case of emergency. Most boats will require that you have completed this course, and it will increase your chances of getting hired. I highly advise you to conduct your own research and make sure that all of this information is accurate and relevant to your situation. Depending on the season, and which region of the world you are in, the competition for jobs can be very high. For example, in Europe, the summer season is very short, and the job market is very crowded. Sometimes it’s necessary to get additional training and certifications if you wish to gain an advantage when it comes to getting an entry-level job. Where should I get my training? 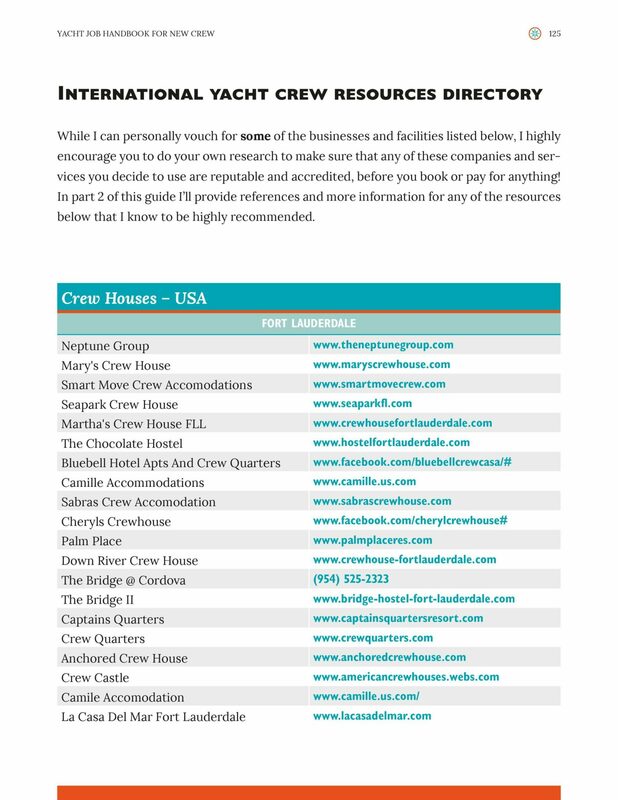 Below I’ve inserted a few screenshots of the International Yacht Crew Resources Directory that’s located in The Yacht Job Handbook Part 1: Get Inspired. Inside this directory, you’ll find links to over 150 tools, resources, agencies, schools, and businesses that cater to yacht crew. 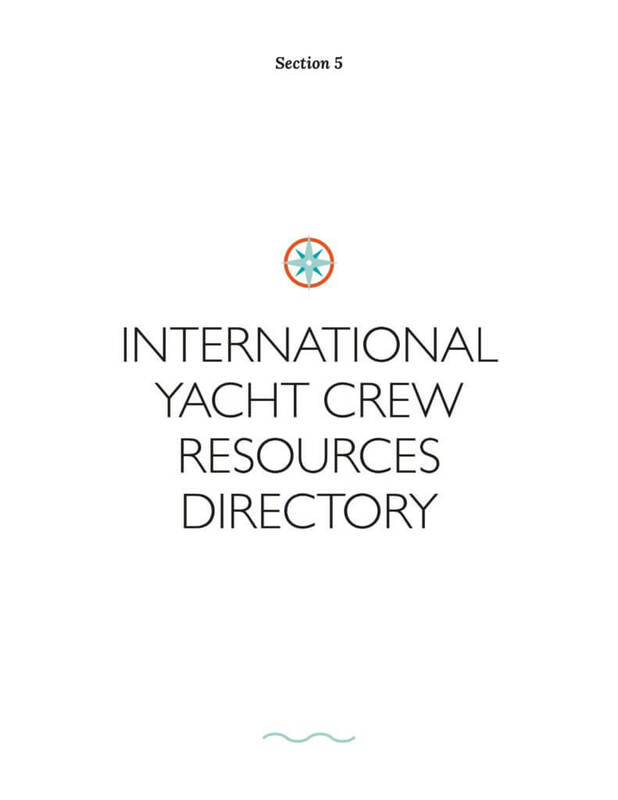 If you’d like the complete International Yacht Crew Resources Directory PDF delivered to your inbox for free, click the button below for instant access. 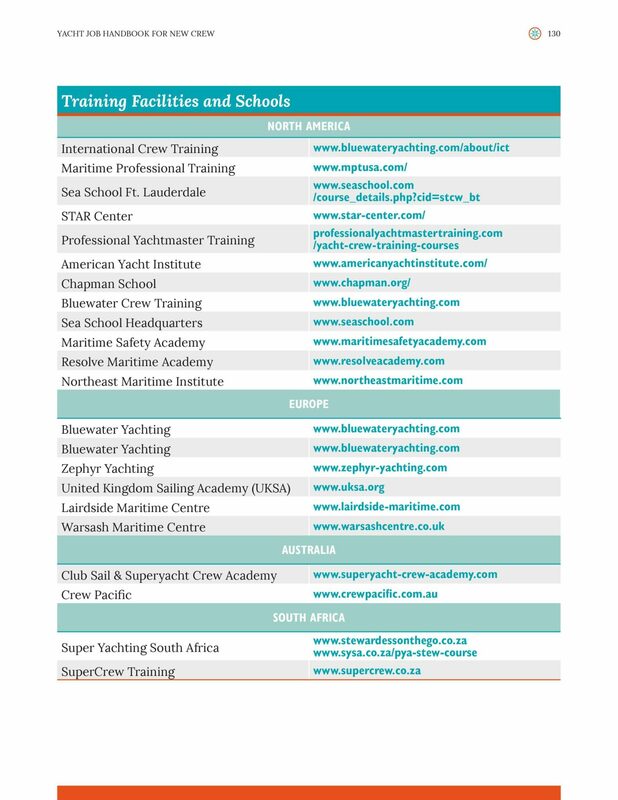 The following links and resources offer STCW and Security Awareness courses which are a minimum requirement for new yacht crew in the US and many other regions. While I can personally vouch for some of the businesses and facilities listed below, I highly encourage you to do your own research to make sure that any of these companies and services you decide to use are reputable and accredited before you book or pay for anything! 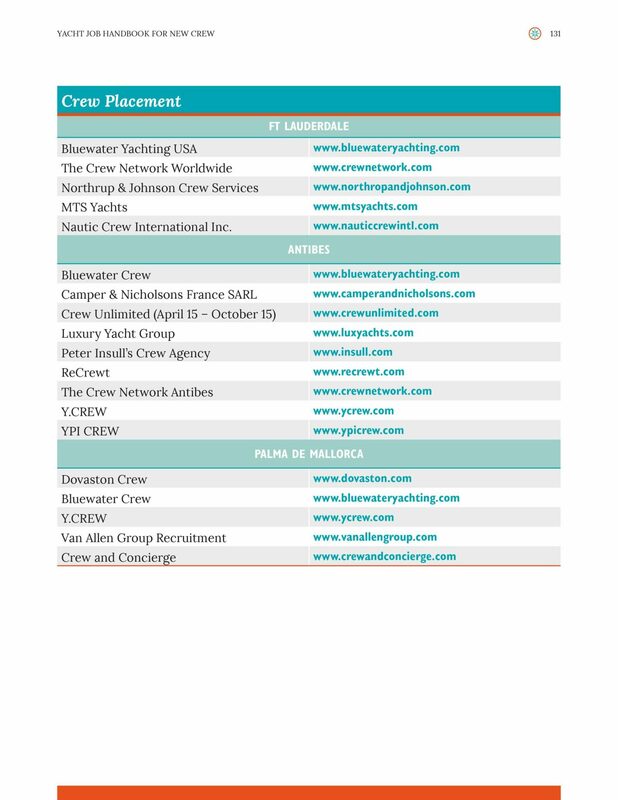 This is an agency with individuals who help place crew looking for work on boats who are looking for crew, and vice versa. Ask around to see which ones are the best, and sign up with all of them. It’s entirely free to sign up with these agencies; you should never be charged. If they do end up placing you on a boat, and the job works out, the boat will pay the fee. Read the post 7 Ways To Gain an Edge in The Yacht Industry Job Market to get more info on networking. 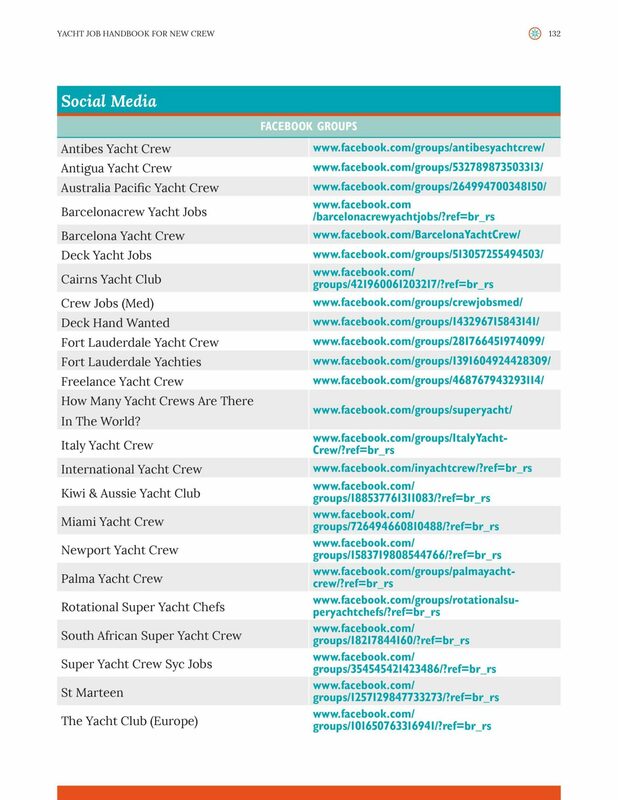 There are lots of social media groups and forums that are dedicated to helping connect crew with boats. Just go to the Facebook search bar and type in “yacht crew” and join all of the groups that seem relevant to your location. Some groups are geared towards crew looking for work, or boats looking for crew, while others are more geared towards general questions and discussions. Next articleIs a Yacht Stewardess Salary Higher Than Yours? 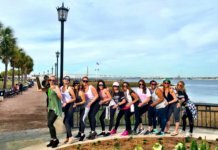 DivaDance is now Partying in Charleston! Is a Yacht Stewardess Salary Higher Than Yours? What is it Really Like to Work on a Yacht?